In 1977, a group of Czechoslovak dissidents drafted and published the Charter 77 manifesto, which called on the communist government to respect human rights. Charter 77 was inspired in part by the 1975 Helsinki Accords, an international treaty signed by the United States, Canada and most European countries. The Helsinki Accords committed governments to guaranteeing basic human rights, such as freedom of speech, conscience, and assembly. But in Czechoslovakia and other communist states, these rights were routinely denied. “The freedoms and rights of the people guaranteed by these pacts are important factors of civilization for which, throughout history, many progressive forces have been striving and their enactment can be of great assistance to the humanistic development of our society. We therefore welcome the fact that the Czechoslovak Socialist Republic has expressed adherence to these pacts. Vaclav Havel, a noted writer and dissident, was among the authors of Charter 77. He and many of his fellow signatories were harassed and imprisoned by the secret police for daring to challenge communist rule. But Charter 77 also became a rallying point for opposition to tyranny. Havel helped lead the nonviolent demonstrations that brought down the communists in 1989 and became Czechoslovakia’s president as the country transitioned to democracy. 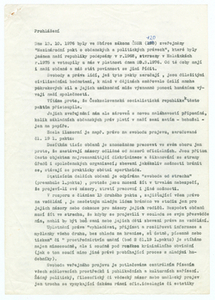 This original copy of Charter 77 was donated to the Freedom Collection by the Vaclav Havel Library in Prague.